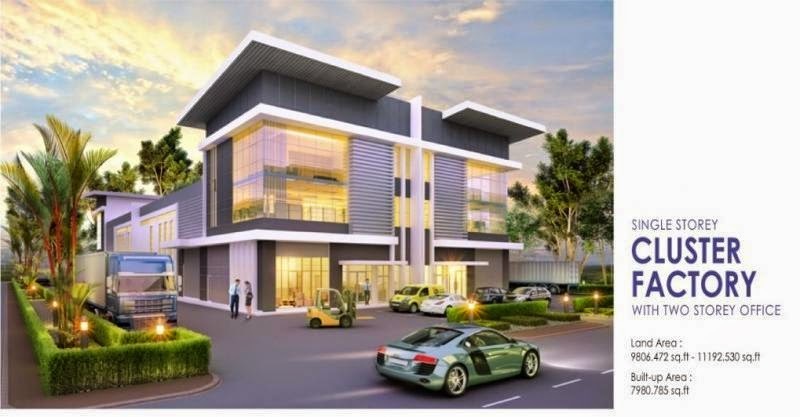 Harvest Green @ Pasir Gudang is an innovative industrial address located at Sime Darby Business Park, Spanning an area of 23.6 acres of land, this excellent industrial park comprises detached, semi-detached and cluster factories set within a secure gated and guarded environment. A simply stunning development comprise of 72 units of cluster factory, 14 units of semi-detached factory and 1 unit of detached factory with 2 storey office each. Expected TOP will be in 2017, developed by Harvest Land Development SDN BHD, a well known professional player in the world of property development. Constantly engaged by refreshing elements of life. The perfect embodiment of class and luxury set in a beautiful environment, awaiting your very presence. Harvest Green is set to be a gem that offers high yield investment return with potential upside capital gain. In fact, an investor is normally ahead of an end user because an end user business operator typically would lease a premise and reserve their funds for business development. Be the investor and not missed this great opportunity to be a part of this excellent development. Keeping amenities to raise vibrancy as well as the living and working environment of the occupants are located around the development. Residents are well connected to all parts of Singapore.Residents who are travelling are also well connected by using important highway such as Senai-Desaru Highway, Pasir Gudang Highway and Coastal Phase 2 Highway. Enjoy the convenience with and address of Harvest Green. Soar to greater peak with a lifestyle that you truly deserve specially designed to create a wonderful home in the heart of the city with a symbol of urban prestige living that exceeds ordinary expectation of living standard. See http://www.harvest-green.net/ for more details or talk to the marketing team at 6100 8806 for inquiries.